Three Ways to Improve Your Painting Today!! Ok, this sounds a little like a sales pitch. Well, to be honest it is. But not in the way you think. The pitch is to get you to the easel, and make the most of this fall/winter period of painting. It’s my favorite time of year to paint. I love to hunker down in my studio and get into a deep groove of painting. It’s going to get cold and rainy outside, so I’ll be really satisfied with time spent in my new, warm digs; I have a gas fireplace just a couple feet from my easel now, so it will be nice and toasty!! I do mean little. 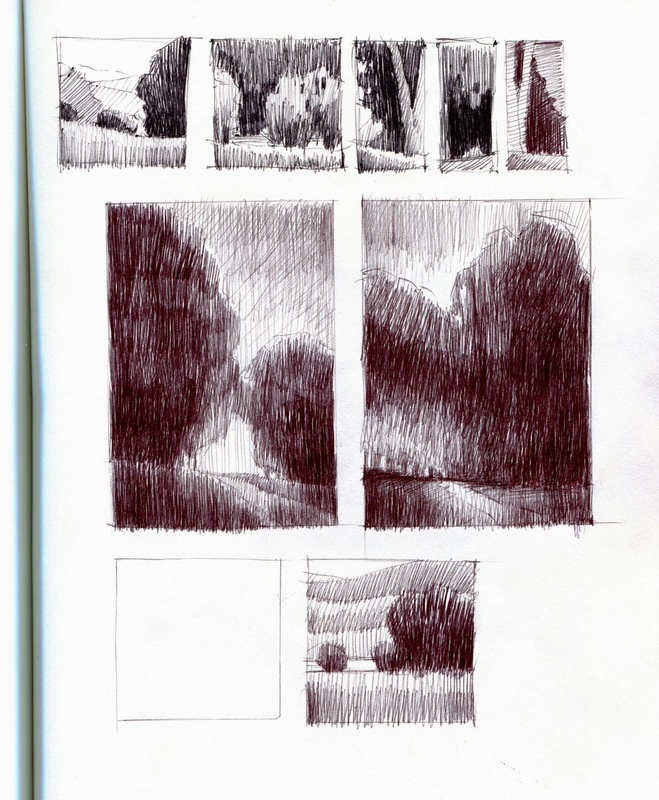 Whether you call it a thumbnail, a notan, a value study, it doesn’t really matter. What matters is taking a few minutes to work out your composition and value plan ahead of time. This doesn’t mean you stay slavishly to this plan if something else wonderful arises, it just means you’ll likely not get caught by an unresolved composition which will just be magnified in the larger version. Yes, our materials are expensive. So is food. So is everything. I do know that if I worry about wasting, I’ll waste. I will be stingy in painting and the painting will be stingy. So, I paint like the proverbial billionaire and try not to worry about it too much. I try to be kind to myself and realize that not every day is going to produce a “winner”, not even every other day or even every week. That’s just part of the process and the “bad” ones are not just part of it but a necessary part of it. Love the bad ones as much as the “winners”. You can’t always be up or you wouldn’t know what down was! A lovely positive up beat post…your new studio set up sounds very comforting. I love #3! What a wonderful perspective to be reminded of. Thanks Marla. Thanks Marla, it is hard to believe you have "bad" painting days but hearing you say it, makes me feel more of an artist myself, if that makes any sense. Your postings are like therapy!